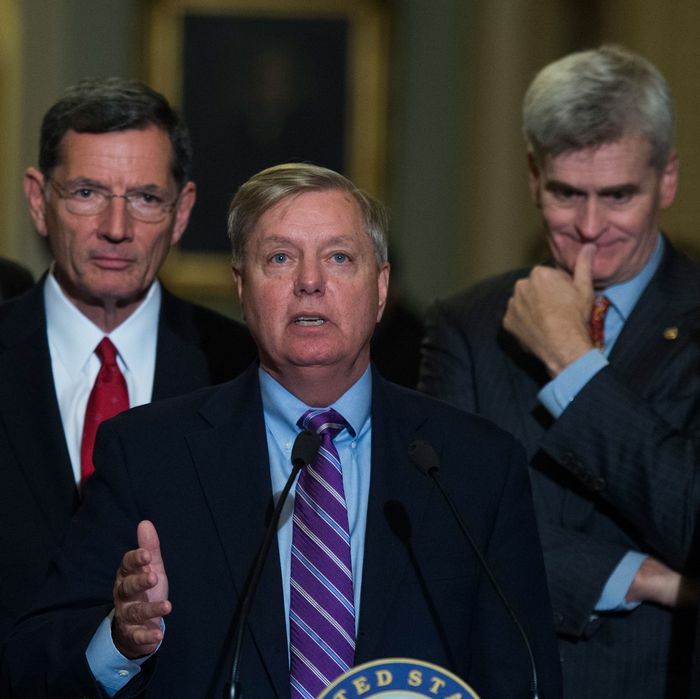 Lindsey Graham and fellow Republicans tout their plan. Can you imagine being accused on national television of sponsoring a law that would hurt millions of people, and lying about its effects, and your response is “We have a deadline”? They are rushing to enact massive, permanent changes to the health-care system because of a legislative deadline? What if you said a used car was dangerously unsafe and lacked any of the promised features, and the salesman’s response was to tell you it’s the end of the month and he has a sales quota to meet? The deadline, of course, is a joke in and of itself. Republicans have had eight years to write their alternative to Obamacare. They’ve had months and months since the November election. The deadline is not a deadline to pass a law. It is a deadline to use a legislative maneuver that severely constricts their policy options but would allow them not to negotiate with Democrats. The latest gambit to repeal Obamacare reflects the tensions of a party caught in a lie. Having told their supporters that Obamacare was a train wreck, and that they could easily write a different law that covered just as many people but at lower cost, they are being caught in their lies. Every Republican attempt to design a health-care law has quickly devolved into an effort to find some other group of politicians to solve the problem. When the House passed the American Health Care Act, its advocates insisted the bill wasn’t intended as a law, but as a prod to get the Senate to write something better. When the Senate tried (and failed) to pass “skinny repeal,” its advocates likewise pled that it was merely a device to create a House-Senate conference, which would somehow find a way to write a good health-care law. Graham-Cassidy shirks the problem by sending money to states and letting them deal with the problem. Or not deal with it. Whatever. The point is that fulfilling their impossible promises won’t be the Republican Congress’s problem anymore. The utter lack of seriousness with which the governing majority has taken its responsibility is an open secret in Washington. “If there was an oral exam on the contents of the proposal, graded on a generous curve, only two Republicans could pass it. And one of them isn’t Lindsey Graham,” a senior Republican aide tells Caitlin Owens. A senior Republican aide. Other senators simply rely on the alchemy of state government. “I think the efficiencies that come with transferring the funding to the states can very well make up the difference between what the federal thing would be,” says Senator James Inhofe. What evidence is there that the “efficiency” of state government will allow much smaller amounts of money to finance greater amounts of coverage? There is none. The actual reality is that, presented with funding shortfalls to Medicaid, states simply do things like restrict eligibility for disabled children, end substance-abuse treatment and hospice care, and so on. There is no magicking away this problem. There is only shirking of responsibility. And the most pronounced fact about the Republican approach to this dilemma is a lack of seriousness about its resolution. They claim their bill can and should be passed without a Congressional Budget Office study of its coverage effects because they disbelieve the CBO (as they tend to disbelieve all technocratic authorities). They do not produce any competing study of their own. Studies by respected private-sector firms like Avalere find devastating consequences to their bill. They would rather not have anybody know. Earlier this summer, Republican senators laid out what they claimed to be their own markers of successful policy. A bill needed financing to treat the opioid crisis, protections for people with preexisting conditions, and so on. Graham-Cassidy has none of these features. And the people who claimed these features were vital simply do not care. To be sure, the party is caught in a terrible bind. They spent years making promises that could not possibly be reconciled — repealing Obamacare and replacing it with a plan that had lower premiums, more deductibles, protections for the very sick, and without new taxes. Now, somebody is going to have to pay for these impossible promises. It may be millions of Americans who will no longer be able to afford medical care for themselves or their families. What Republican senators have revealed is that their single highest priority is to ensure that the consequences for their lies are borne by somebody other than them.